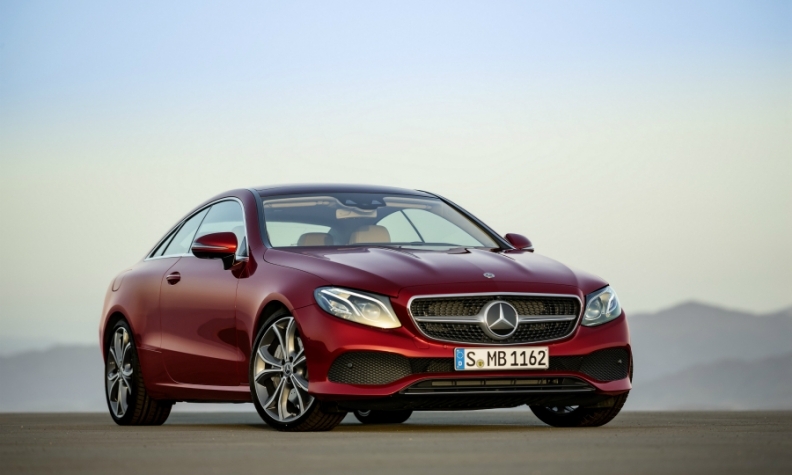 The Mercedes E-class coupe's long hood and rearward-shifted greenhouse give it a dynamic road presence. Mercedes-Benz is repositioning its E-class coupe to offer more room and more functionality, promoting the sporty two-door model as the only offering in its niche that comes with four full-size seats. The latest-generation E-class coupe is 123mm longer at 4826mm, 74mm wider at 1860mm and 33mm taller at 1430mm than its predecessor but its sloping roof and compact rear give it a sleek appearance with class-leading aerodynamics. Practical features have been added to the car, including for the first time a foldable rear seat bench to expand the trunk for bulky items such as skis or golf bags. Mercedes designed the E-class coupe to be roomier than the S-class coupe, which is in a segment above, because the cars are aimed at different target groups, said Christian Frueh, the car's chief developer. The S-class coupe is positioned against sport coupes from brands such as Aston Martin whose customers "care much more about driving performance with a lot of power and a suspension that's astonishingly stiff," he said. In such cars "you typically only find the leather jacket of the driver in the back," Frueh said. The E class is "the only coupe where four people can sit fully relaxed within a high-quality interior that almost has the same look and feel of an S class," he said. Like the original W114 Coupe built in 1968 and every generation since, the E class is the only coupe in its segment with no B-pillar. This gives the car a more airy feeling while also making it easier for rear passengers to enter and exit. The coupe and its convertible sibling accounted for roughly every fifth E class sold globally for the previous-generation model family, which also included sedan and station wagon variants. The E-class coupe gets the same connectivity and safety assistance systems as the sedan, including a semi-autonomous driving technology that keeps the car at the correct distance behind vehicles on all road types and, for the first time, can also automatically follow them at a speed of up to 210 kph. Technology: A smartphone app allows drivers to park the car remotely in garages and narrow parking spaces. Cool feature: The coupe is the first E class that offers windshield wipers with integrated nozzles that distribute water directly in front of the blade to reduce smearing and improve visibility. What's good: Practical coupe with plenty of room and cargo space for a price far more affordable than rivals of the same size. What's bad: The two optional 12.3-inch displays that replace the instrument cluster and middle console are taken from the older S class and look dated. They also have no touch control.